Derrick Storm is a part-time agent for the CIA. His full-time job is that of a private investigator and it is through that occupation that he would be pushed into a connection with the Company that would change his career path substantially. It definitely was not something he wanted or planned but in the life of Derrick Storm, many things do not go as planned. It is fairly obvious that Storm craved excitement and relished the thrilling thought of danger for he sought out his day job from an early age. It is not so certain that he wanted the actual chance of pain and agony that can come from tailing someone who did not appreciate being followed and who might be a lot bigger and stronger than the average height and slightly below average physique of Storm. In his first couple of recorded adventures, he is actually a tad surprised when fists fly and bullets zing. To his credit, he adapts quickly. His desire for adventure likely came from watching his father and that man's job as an FBI agent. Little is said of the work that man did but it is clear from the occasional quips his dad makes that he knows a thing or three about the real world. The man also maintains the common less than cordial feelings towards the CIA and its minions. Storm probably would have followed in his father's footsteps but it is clear that his lack of discipline and natural response to authority would mean he would unlikely have graduated from the Academy, much less survived in the ranks. Storm likes to speak his mind, almost always with several pinches of sarcasm, something that would not go over at all with the chain of command. As a result, Storm did not go into formal law enforcement but got his investigator license and went out on his own. He struggled for a while, considered giving it up but for what else he had no clue. Then a wife seeking a missing husband case sent him off on a job that would put his up against a rogue CIA agent, a good deal of stolen Agency gold, and a chance to make his reputation and his fortune, assuming he lived long enough. Over the course of the series, Storm would go from being pressured into working with the CIA as their unofficial private "snoop" to being an actual agent to being dead for a while to going back into the spy and private eye business again. He would have far more excitement that he ever thought or truly wanted but his quick repartee would never falter. What a concept! 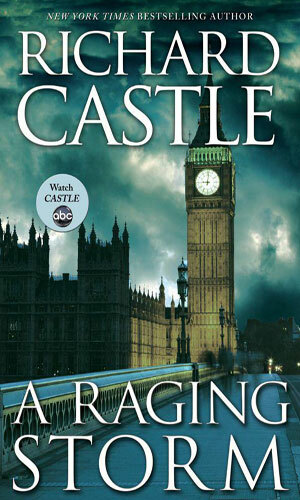 ABC had a new crime series about a popular detective/spy/adventure writer named Richard Castle. He had written several bestsellers over the past decade or two with his greatest success coming with a private eye turned CIA agent named Derrick Storm. An even dozen of these novels had propelled his name to the top of the charts repeatedly and he was a celebrity in New York City circles. Still, the storyline went, he was grown tired of Derrick Storm and decided a clean break was in order. He killed off the character. Then he went looking for his next series character. He wanted to move from the spy/private eye genre to a police drama and to get a taste of what it was really like, he asked his friend, the mayor, for some ride-along time with real detectives. Detective Kate Beckett of the 12 Precinct was the poor soul shackled with the enthusiastic but quite unprepared writer, along with two of her fellow police investigators, Kevin Ryan and Javier Esposito. Together the four would face a new homicide every week and each one would see intelligent work by the cops and goofy, hair-brained and eventually ingenious deductions by Castle. All the while they were solving crimes and catching bad guys and getting closer and closer until they were the best of friends, and in the case of Castle and Beckett, engaged. 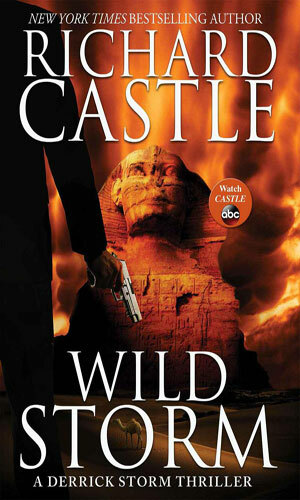 And Castle had turned his ride-alongs to even greater literary success with the character modelled after Beckett, Nikki Heat. From March, 2009 on, the show entertained millions each week. As time went, the series just grew in popularity. And the people behind Castle were not content with just a hit show, though that was their main goal. The character of Nikki Heat, heroine in the fictional pages of the fictional writer Richard Castle, became a heroine in "real world". The first book in the Nikki Heat, Heat Wave, became an actual adventure novel that fans of the television show could buy and read. And they did so in impressive numbers. 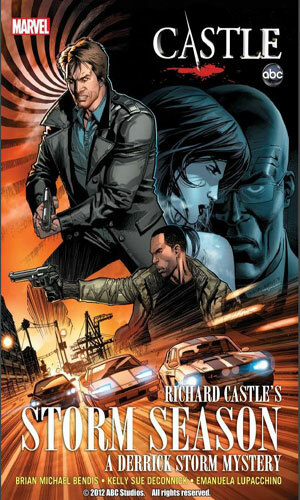 After a couple of years and a well-received graphic novel or two based on books that Richard Castle had already written, in the television show, about Derrick Storm, the powers that be figured if Nikki Heat books were doing so good, why not actual Derrick Storm books. Now Derrick Storm was dead, killed off by the author to start fresh on his new series. The powers had two choices - either release versions of the book that Richard Castle had "written" or resurrect Storm for new adventures. They chose the latter. The books detailed below are those new tales of excitement. However, there remains a point that deserve mentioning. 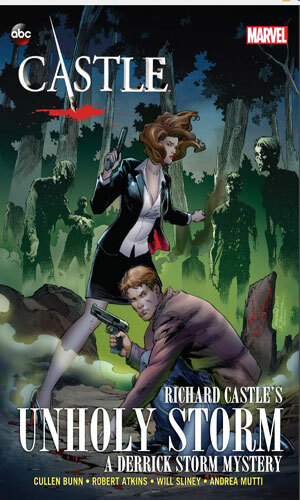 The powers had decided to start anew with Derrick Storm but for fun, they listed on the web page for Richard Castle the new books that actually exist and can be purchased just as most authors have today on their own sites. 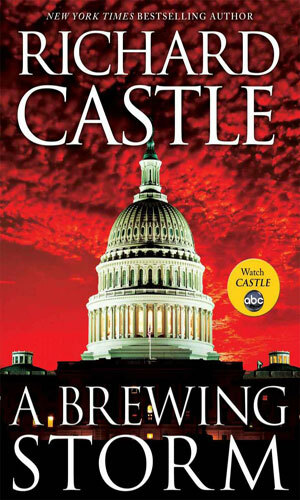 They also listed each of the books that Richard Castle had written before the Nikki Heat adventures, along with plot lines and often actual covers. These books are, unfortunately, "out of print" so they cannot be bought. Genius marketing! Deadly Storm - While tracking down a missing husband for a desperate wife, Private Investigator Derrick Storm discovers there’s a lot more to the job than he’s been led to believe when he discovers the missing husband is actually a rogue CIA operative involved in selling national security secrets to enemy forces. He soon finds himself knee deep in international intrigue when he’s recruited by the lovely and dangerous Clara Strike, a CIA agent with a penchant for trouble and adventure. Storm Season - Storm's job is to bug the hotel room of a visiting African leader but when he hears a woman's scream on the tape, things get really strange really quickly. Unholy Storm - When the daughters of four high-powered international businessmen are discovered dead in New York City, the NYPD scrambles to bring the murderer to justice. But when a fifth girl is found mutilated in a pool of her own blood, her prestigious French family hires Derrick Storm to run his own investigation and find the real killer. With limited access to evidence, Storm has only one lead – a strange symbol drawn in blood at each of the five crime scenes. While immersing himself in voodoo religion and rituals, Storm enlists the help of the beautiful and daring Clara Strike, his CIA handler. Together they uncover a deep web of deception under the guise of mysticism and devotion. And in a race against time, this most unlikely pair unlock the mystery behind a network of international assassins capable of creating a global catastrophe. A Calm Before Storm - Someone called 'The Fear' is causing considerable trouble and it involves Derrick Storm and his father. To help figure out what is going on, Storm appeals to Clara Strike but if she gets involved, it may be to stop him. Storm's Break - A brutal cold snap has practically brought Manhattan to its knees, driving the island’s denizens indoors. The city’s homeless are driven down, into the bowels of ancient train tunnels and the concrete roots of skyscrapers. It’s a world of predators and prey, and when runaway teenage girls start disappearing into this underworld, Derrick Storm isn’t afraid to find out why. It doesn’t take long before Storm trips to an international human trafficking ring headed by notorious Panama kingpin Marco Juarez. Teaming up with reliable and gutsy CIA agent Clara Strike, these two race to stop one of the world’s most vile criminals before he destroys more innocent lives. Storm Warning - When Derrick Storm’s close friend, Attorney Sam Strummel, is murdered in cold blood in a cemetery outside of NYC, Storm launches his own investigation to bring the murderer to justice. While investigating Strummel’s business dealings, Storm exposes a murder-for-hire syndicate that has just made him their next target. Gathering Storm - While packing his bags for a much-needed vacation, Storm gets a call from CIA Agent Clara Strike with an urgent mission. Storm must help protect the Swiss Ambassador’s daughter against a formidable foe: a former KGB officer who is known for killing his victims with undetectable poison. When the mission is compromised, Clara fears that there is a mole in the CIA. In a bold move, Clara decides to put Storm undercover at Langley in order to smoke out the guilty party. Unexpectedly, Storm does more than just that; he uncovers a conspiracy that goes to the top levels of the agency and threatens Clara’s livelihood. Storm Rising - On a quest to recover a rare sapphire stolen from one of Manhattan’s elite, Derrick Storm comes face to face with Bentley Silver: notorious jewel thief and rival womanizer. As the two men compare their conquests, they form an unlikely union in order to bring down a Parisian thief who threatens to undermine Silver’s livelihood and Storm’s bank account. A trail of stolen jewels leads Storm and Bentley to an underground international society, which is shrouded in secrecy and has a deadly mission. Driving Storm - Storm faces his toughest case to date when CIA Agent Clara Strike asks him to clear her sister Susan’s name after she’s accused of murdering her husband. Strike insists that it was police incompetence and tainted evidence that led to her sister’s arrest. Storm tales the case, only to realize that the police conspiracy against Susan isn’t just Clara’s hunch, it’s a stone wall of silence even he may not be able to get past. And the closer he gets to the truth, the more danger he puts Susan in, leading Storm to a terrible choice – prove her innocence or save her life. Storm's Last Stand - An ex-con out for vengeance, an old lover looking for closure, and a hardened cop hoping to find peace of mind all come crashing into Storm’s life when a man they all know jumps off the Brooklyn Bridge. Or was he pushed? Now these former foes must work together to solve a crime that brings up their complicated past history and some memories better left forgotten. Storm must protect his reputation, heart, and possibly his life while unlocking the mystery behind his friend’s death. 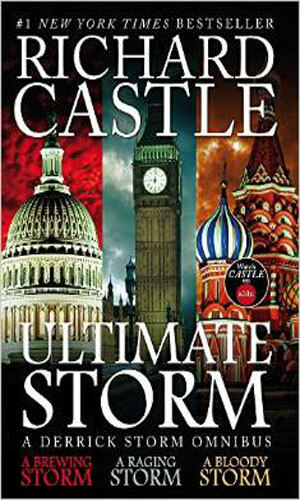 In the midst of this, CIA Agent Clara Strike calls on Storm to help with what she deems, an “easy” task. But when this mission leads to Clara’s abduction by MI5 agents, Storm must balance his two identities and cases while trying to save Clara’s life. Storm Approaching - After a New York City doorman is gunned down in a brazen daylight drive-by shooting, Derrick Storm gets a surprising wake-up call from Langley. CIA handler, Clara Strike enlists Storm to uncover the real story behind this murder of the doorman, who was in fact and undercover operative. Storm follows the trail of the killing to the graffiti lined halls of Brooklyn’s most dangerous housing projects. Battling well-armed gangsters and almost insurmountable social barriers, Storm unearths an international drug ring conspiracy orchestrated at the country’s highest levels. Storm Fall - Storm is finally feeling like he has his life back: a few open and shut PI cases that lack any danger or intrigue and no recent calls from CIA Agent Clara Strike. But when her lack of contact begins to concern him, Storm begins to search for the woman who he has begun to care for as more than just a colleague. But what Storm unravels quickly turns his world upside down. Is Clara the CIA agent she claimed to be or a rogue spy operating outside of the law? Just when he begins to scratch the surface of the truth, his bank account is drained and a murder of a rival PI is pinned on him. Storm must take on his most challenging client yet: himself. Is this the work of Clara or one of his many enemies? Storm has to comb through his entire career as a PI and as a secret CIA operative: every criminal he put away, every crime he solved, every life he affected, in order to find out who would do this to him. Will he find the culprit pulling the puppet strings or will this be the end of Derrick Storm? Compilation of three previously released novellas: A Brewing Storm, A Raging Storm, and A Bloody Storm. He was thought dead but now a few years after his demise, Derrick Storm returns when his old nemesis, Gregor Volkov, gets busy torturing and killing bankers all over the world. Derrick Storm is on a plane that starts to nose dive. He is able to save it and the passengers but then learns that whoever caused the accident also took out three other planes. Storm is asked by the government to investigate and he learns of a powerful laser in the hands of an extremist. The three novellas were first released individually in e-book format before being combined into a omnibus. They comprise a trilogy. Derrick Storm's old boss at the CIA asks Storm to come out of retirement to help unravel a kidnapping of a Senator's son. He must work in conjunction with a beautiful FBI agent, April Showers. An assassin is the target of Derrick Storm's investigation, not to mention almost sixty billion dollars of gold bars. Along with him is April Showers and tension between them is mounting. With the help of a few other former agents, Derrick Storm is in Russia hunting down the mission gold as well as rescuing April Showers from a psycho. 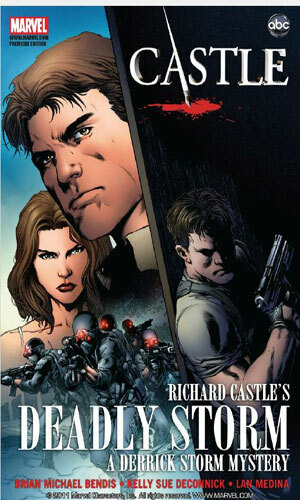 With the growing popularity of ABC's Castle, Marvel Comics, owned by the same parent corporation as ABC, Disney, decided to make use of that success with a graphic novel. 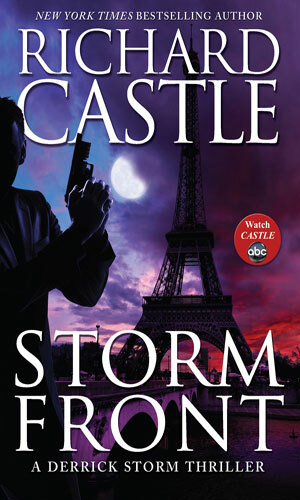 They came up with the terrific idea of "adapting" the first Derrick Storm novel that Richard Castle had penned, Deadly Storm. I thought it genius since Castle being a fictitious author and there not being an actual book about that adventure, the authors had a pretty good opportunity to put their own stamp on the characters. That success bred another go-around and the next year a second "adaptation", this one being of the second book, came out. Obviously it did well enough that the following year, Marvel came back with another adventure, still using the idea of adapting a Castle book. This time it was A Calm Before Storm and they took a different approach. The team doing the work was different. 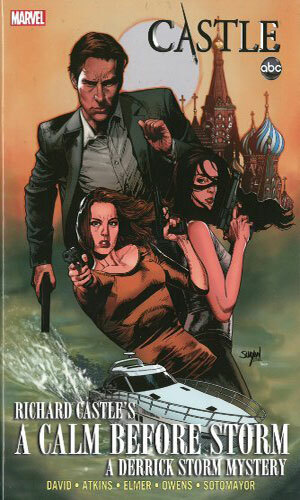 Also, they broke the story into a 5-issue comic book mini-series before bundling it as a graphic novel. Yet another year passes and another Derrick Storm graphic novel adventure comes out. This go-around, it was just as a graphic novel and with another team but it was still excellent. The adaptation of the first Derrick Storm novel, this adventure shows how the initially bumbling Storm becomes a deadly CIA operative. The adaptation of the second Derrick Storm novel, Storm's job is to bug the hotel room of a visiting African leader but when he hears a woman's scream on the tape, things get really strange really quickly. The graphic novel is a collection of a 5-issue comic book mini-series - Someone called 'The Fear' is causing considerable trouble and it involves Derrick Storm and his father. To help figure out what is going on, Storm appeals to Clara Strike but if she gets involved, it may be to stop him. After several daughters of powerful businessmen are murdered in New York, one of the dads hires Derrick Storm to find the killer. Storm calls upon his CIA handler, Clara Strike, to help. I so dearly adore genius in marketing. There is so much in the ad world that numbs the senses that when true brilliance comes along, it is truly like the sun coming out from behind the clouds. That is what the Derrick Storm series of books are - brilliance. I am not saying the books themselves are brilliant, although they are pretty darn good. Just the idea of the existance of the books is terrific. The television premise was that the fictional character Derrick Storm was killed off by the author seeking a new inspiration which he found in Detective Kate Beckett, remodeled into Nikki Heat. 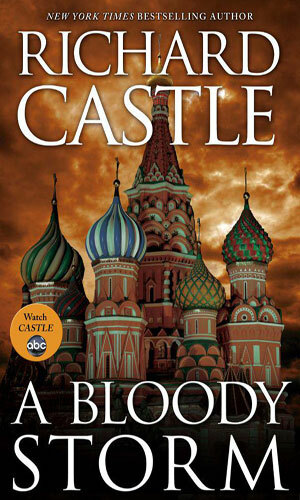 The producers could have just released the books that "Richard Castle" had written before killing Storm off - and they still might. But writing books about a character that the reader knows is going to die is not a key to success. It could work. It most likely would not. But to have the author resurrect the hero in a new book and then coming out with the actual book is terrific because that allows more books to come and if the producers do decide to draft the earlier novels, they are not shackled by a soon-to-die lead. And the books are good! That is called icing on the cake.